Blockchain to the rescue Before we get started this week, we’re sharing some good news for the data-lovers in the sector. We have just made available some open access sections on our intelligence portal. We will provide more on this next week, but if you want to be the first to see new data, get going here. P.S. Several links in the letter will now take you to these portal pages, too. To this week’s letter… Since Bitcoin’s introduction to the market in 2009, the debate as to how blockchain, distributed ledger technology (DLT) and cryptocurrency (“blockchain”) can change the payments world has been raging on. 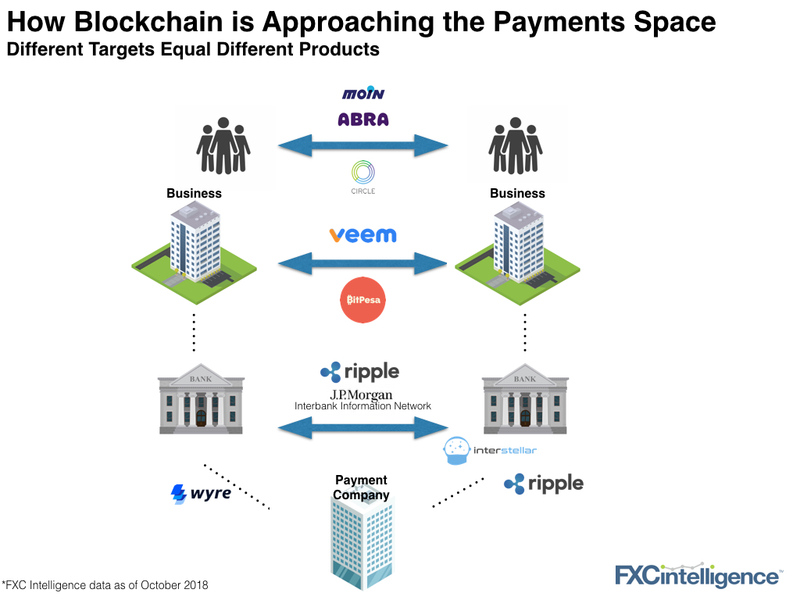 This week, we’re taking a detailed look at the blockchain players focused on changing the international payments industry. In our chart, you can see that blockchain technology goes far beyond peer-to-peer payments, with products being developed for two core purposes. The main benefit is often around speed, especially moving funds from or to developing markets, which benefits financial inclusion too. Second, blockchain can provide accurate tracking and messaging through its ledgers. Third, treasury functions can be optimised by reducing the need to pre-fund in the recipient market. The big question on everyone’s mind is not whether blockchain can become a larger part of the payments world. It’s already there. Of the companies above, Ripple is certainly furthest along operating in 40 countries for its RippleNet (SWIFT alternative) product and JP Morgan has 75 banks signed up to its initiative. The questions are how blockchain moves beyond its focus on solving developing market settlement issues and reducing counter-party risk and how it moves from pilots to widespread use. Aside from the lack of (centralised) regulation and common technology standards, what else is holding this development back?